The Lower Elementary Cottage: Pumpkins, Bats, & Spiders, Oh My! GIVEAWAY for my 100th Post! Pumpkins, Bats, & Spiders, Oh My! GIVEAWAY for my 100th Post! This is my 100th post!! I can't believe it! I started this little blog after reading all of your amazing ideas, convinced no one would read it... and here I am on post #100 and still soooo excited to swap ideas and materials with you! I've been dying to host a giveaway and I was trying so, so, so hard to wait until my 100th follower, but I've gotten impatient! So instead I'm going to have my first giveaway to celebrate my 100th post!! Check it out! I'm going BIG today!! I have a new product, a SALE, & a GIVEAWAY!!! Everything in my TPT and Teachers Notebook stores are ON SALE for 15% OFF through Monday!! 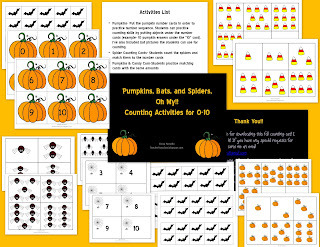 I have just created a fun math learning center set just in time for Halloween! My kids are learning and practicing their numbers to 10, so I created a set of fun themed activities. Did I mention I have a student obsessed with Halloween?! He was a huge inspiration for this little creation! So here's the deal, it's currently on sale in my TPT store for $2.13 (regular price will be $2.50 after the sale) or you can try to win it for free! This 17 page set has 3 super fun activities! Here's your chance to WIN it!! I won something this week, maybe you will too! This is so cute, I would love to win it!